Trampolines are elevated and buoyant canvas sheets or webbed beds that are supported by elastic shock cords and springs. These come surrounded by metal frames. They are used as springboards for tumbling. In sports, trampolines are used for rebounding the athletes, so that they can perform the acrobatic movements in the middle of the air. Now, measuring your trampoline is crucial. You should be able to measure your trampoline so that you can have the correct measurements of your jumping pad or net. Having an improper measurement can lead you to purchase mats and nets that might not fit your trampoline. Trampoline mats are built in a manner to withstand wear and tear and hence they are extremely durable. However, with time, the trampoline mats can lose their durability and if they are not replaced, there may be chances of accidents and injuries. Each trampoline has its own capacity and can handle weight up to a certain limit. When the weight-bearing capacity of the trampoline exceeds, the mats start to stretch and sag. This is why; you should be able to measure your trampoline properly so that you can replace it on your own, without having to call for an expert. You should fit the jumping pads and nets of a similar size and ensure that they are not bigger than the measurements taken. You have to keep in mind that all the trampolines are not of the same shape. Trampoline mats can be square, circular, rectangular, and octagonal. The size of a trampoline that is round can be measured by calculating the diameter of the frame of the trampoline. To measure the square or rectangular trampolines, you have to follow the following steps. Firstly, you have to start from the exterior metal edge of your trampoline on two short sides. Next you have to measure the opposite sides, from the inner to the exterior metal. The diameter of the frame has to be measured again, and this time you can measure any two of the long sides. 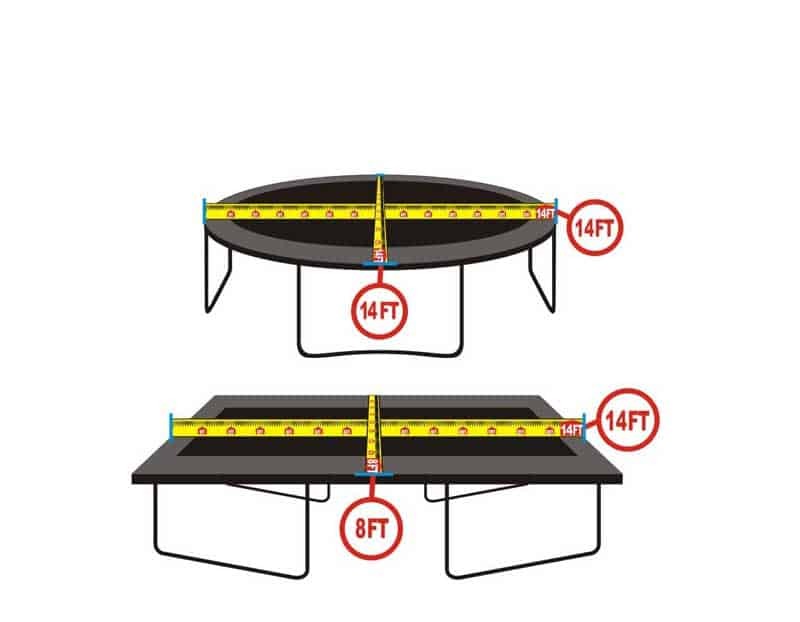 These two measurements will allow you to understand the dimension of the rectangular or square trampoline that you own. For measuring the octagonal trampoline, you have to measure the metal frame’s diameter from one corner to another. You should measure the frame only when the springs are attached properly and the jumping mat is installed in the correct manner. If you follow these tips, you can measure your trampoline without any hassle and difficulty. How to Measure Trampoline Mats? If you observe that your trampoline has started showing signs of mishandling and ill-treatment, you should consider replacing the mat in order to remain safe. You can think that replacing the trampoline mat is a hassle and will be difficult, but the truth is that it is extremely easy. Firstly, you have to measure the size of your mat so that you do not end up purchasing an improper size. In order to measure the mat of the trampoline, you have to keep the following steps in mind. For finding the diameter of the trampoline, you have to start measuring from the outer edges. You have to measure from the edge to its opposite side. After this, the frame of the trampoline has to be measured again, but this time you have to measure in a perpendicular manner. Consider the average of these two measurements that you have taken. When you measure twice, you can be assured that you are getting the accurate measurements of your mat. For measuring a circular mat, you have to fold the map into a semi-circle and take the measurements by measuring the straight side of this semi-circle. If you still feel that you cannot do it alone, you can take help from your family members. Ask them to measure the length, and then cross-check both the measurements. You can also call upon experts from whom you are going to purchase your new trampoline mat. They will provide you with the perfect measurements and you can replace your mat to avoid accidents. How to Measure Trampoline Springs? The trampoline springs can stretch and provide the appropriate tension, which is required for jumping on it. These springs are made up of the highest quality wires to withstand pressure and weight. But with time, the springs can start getting weak and stretch due to all the weight that it has handled over all the years. There are chances that they might break as well. When the springs start wearing out, you will observe that you will not get the exact jumping effect that you used to get. A broken trampoline spring can lead to an accident. When you use your trampoline while the springs have started to wear out, you are damaging your trampoline mat. When you bounce, the mats will be pulled to a single side, which exerts more pressure on both the trampoline mat and the spring. Therefore, it is crucial to check these springs every month to ensure that they have not broken. If you see that the springs have broken or are showing signs of damage, you should replace them in no time, or they can be dangerous for your kids and you. Measuring the trampoline springs is easy and simple. Follow the methods that are listed below to get a clear understanding of how you should measure the length of the springs. The trampoline normally has three springs. You have to remove these three springs from the trampoline. Next, you have to measure the length of the spring with the help of a measuring tape from one end to another. This step has to be repeated for all the three springs. After this, three of the measurements have to be compared. When you compare the three values, you will understand the accurate measurement of the springs. Once you get this measurement, you can purchase new springs, and your trampoline will come back to life again. When the weight-bearing capacity of the trampoline exceeds, the mats start to stretch and sag. Each trampoline has its own capacity and can handle weight up to a certain limit. The trampolines are stored outside your house and it is obvious that they have to go through a lot of weather changes. For example, rainwater tends to affect the integrity of the trampoline mats as well the springs of the trampoline can start to rust. Snow exerts a lot of pressure on the mat, thereby forcing the mat to sag. If you want your trampoline to remain perfect for years, you should protect it actively from the elements of weather. Another important cause of your trampoline mat wearing out is through any kind of accident or ill-treatment of the mats. When branches fall in your mat or fireworks fall, your trampoline mat can be damaged completely. Anything sharp and harmful should not be kept in proximity to the trampoline. Your kids will never know the harm and damage that they can face if they bounce on trampolines that are starting to get old and rusty. Hence, it is your duty to check the mats and springs every month or after a heavy snow or rainfall, to prevent fatal accidents. The trampoline mats and springs should be measured properly before replacement. Remember, your safety is in your hands and you should be extremely careful about it.